Wichita State University and Wichita Transit have entered a new partnership to provide free transit to students. In addition, a new publicly accessible bus route will be added to the transit system to serve university locations and provide service along Oliver Street. Beginning January 22, 2019, WSU students, staff and faculty will be able to ride any Wichita Transit regular fixed route bus for free during normal operating hours by presenting a valid Shocker ID to the driver. A new bus route referred to as Route 202 will connect WSU locations of the Eugene M. Hughes Metropolitan Complex, the main campus and the WSU South location at 3805 E. Harry St. The route will travel north and south on Oliver without connecting to the Wichita Transit Center. Service will run on an hourly schedule Monday through Friday beginning at 7:30 a.m. and ending each day after the conclusion of WSU evening classes. “This new partnership is going to be a tremendous benefit to the WSU students, faculty and the general public alike. This partnership provides WSU free citywide access to our transportation network while adding a new route for the general public,” said Transit Director Mike Tann. Route 202 will operate similarly to other transit bus route in that it will be open to the public and stop at marked bus stops along Oliver between East 29th Street North and East Harry St. Route 202 will cross six other fixed transit routes, providing multiple connection options to the Transit Center. 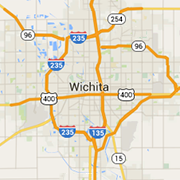 Operating costs for Route 202 are being covered Wichita State University. A new Q-LINE Connector shuttle will run from 8 p.m. – 1 a.m. on Fridays and Saturdays during the spring semester, connecting the WSU main campus to the free Q-LINE trolley route on Douglas Ave. The shuttle will stop at WSU’s retail and restaurant development – Braeburn Square – as well as the three campus housing locations. Wichita Transit is the largest transit system in the state of Kansas. Serving more than 1.4 million riders in 2018, Wichita Transit operates 18 fixed bus routes six days-a-week. Transit services include traditional fixed routes, a newly expanded downtown trolley service and a demand-response paratransit service. Complete route and schedule information is available at wichitatransit.org.